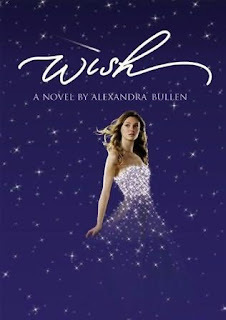 Alexandra Bullen's debut, Wish, is an imaginative and layered read. Bullen really makes what might be a tired and overworked premise and turns it into something magical and entertaining. There are many points of conflict though, enough that the book never feels boring or slow, but they are perhaps just slightly overwhelming. Olivia is dealing not only with her sister's death, but her parents' withdrawal and constant arguments, moving to a new city and trying to fit in, all the while juggling three magical dresses, making friends with the popular group, falling for her new friend's ex-boyfriend, and keeping her friendship with her mom's co-worker's son platonic. It's a lot to take it, and occasionally Bullen drops the ball with one or two of the aforementioned issues, but everything comes together neatly in the very end. It's sweet to watch Olivia's transformation as she learns to step away from her grief and the shadow that Violet left behind and function as her own person. Violet herself is very much alive throughout the course of the book, making Olivia's pain and grief more tangible to the reader. The other supporting characters are surprising but realistic, and make Wish a very entertaining read. Bullen’s descriptions of the San Francisco area are also excellent, and she really makes the reader feel right at home, in both Olivia’s home and neighborhood; the only thing that seemed unnecessary was the mention of large amounts of alcohol toward the end. The ending has a little bit of a surprising twist, but everything comes together neatly as friends make up and Olivia’s family moves toward closure. This is a very sweet, poignant, and entertaining novel, and despite how busy the plot is, readers looking for something touching with a bit of romance, humor, and magic will enjoy Wish. Cover Comments: I love this cover! It's very pretty and simple, but yet it conveys the magical air of the novel very well. I just love how her dress is made up of stars, as they hold some significance within the story. The actual finished copy is also much prettier than the picture, with its glittery details. Very nice! I love this cover. Wish is definitely on my To Read list! I've heard great things about it!!! Thanks for the review! hey I just want to say Thank You so much for reviewing all of these books! I always find the new books I'm going to read from your blog.